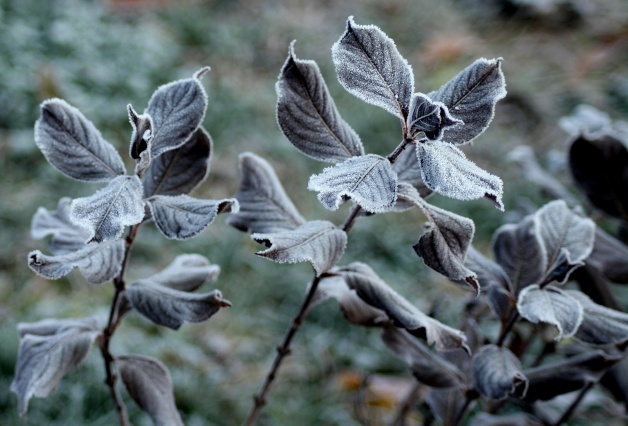 What’s Happening in February at CCCU? 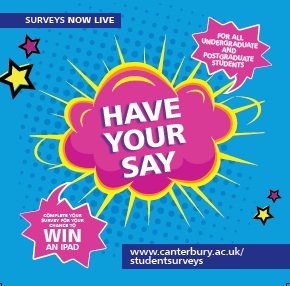 Every year the University takes part in several major national surveys that enable you to provide us with valuable feedback that will help us to shape the future of Canterbury Christ Church University. (NSS) National Student Survey, for final year students. (UKES) UK Engagement Survey, for 1st and 2nd year students. (PTES) Postgraduate Taught Experience Survey, for Masters, Postgraduate Certificate or Diploma Courses, on any year of study. (PRES) Postgraduate Research Experience Survey, for PhD, Doctoral or Research Masters students. You will be emailed a link to the survey that you can complete. 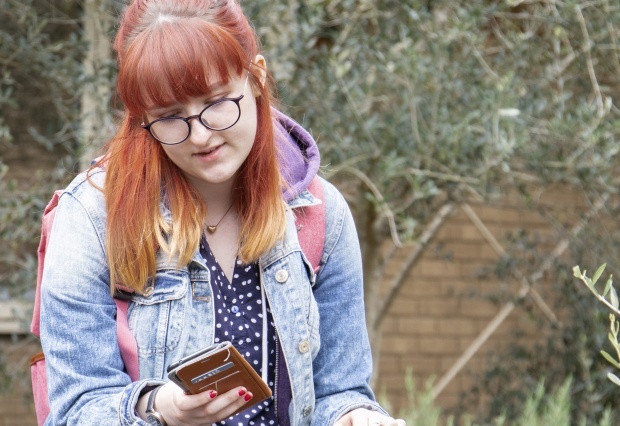 This is your opportunity to improve and shape the student experience at CCCU. Your feedback will help us to build on our successes and to continue to improve our learning and teaching. To find out how your feedback has been used and made a difference across the University, click here. For more information on each of the surveys and incentives, click here. Nominations are open for the SU Elections 2019! They’re looking for people who can champion student causes, represent the student body and campaign for change. Sound like you? 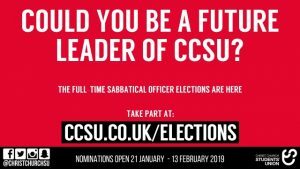 Want to work full-time with the SU from July 2018-July 2019? 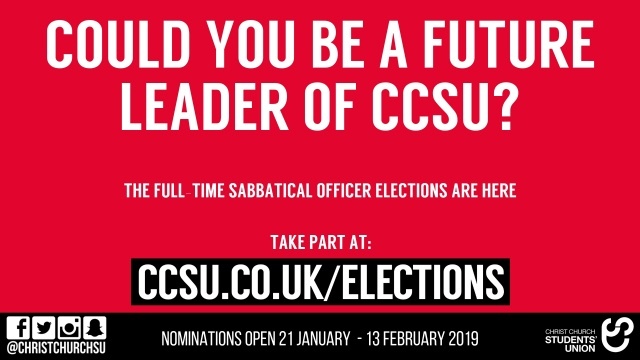 Get involved and become a Sabbatical Officer. But hurry, as nominations close on 13 Feb! For more information, including key dates, click here. An Audience with Lady Phyll: Tuesday 05 February 2019 at 6.00pm in Michael Berry Theatre (Og46). Researching the Rainbow Conference 2019: Friday 15 February from 2.00pm till 7.00pm and on Saturday 16 February from 10.00 till 5.00pm at the University of Kent. The conference is free to attend, open to all and tickets can be booked here. Christine Burns MBE presents Trans Britain: Our Journey from the Shadows: Tuesday 26 February 2019 at 5.30pm in Michael Berry Theatre (Og46). For the full programme and more information, click here. Also keep an eye out for displays in Augustine House Library, as well as social media and blog posts throughout the month from the Library Team (@ccculibrary). Postgraduate Routes Into Teaching Open Day: 2 Feb between 10am-2pm in Augustine House. Discover our wide range of courses in early years, primary, secondary and further education. Whether you are thinking about what to do after your degree or you are looking to change your career we can help you find the best route to become a teacher. For more details and to book, click here. Postgraduate Open Evening: 28 Feb between 6-8pm in Augustine House Hall. 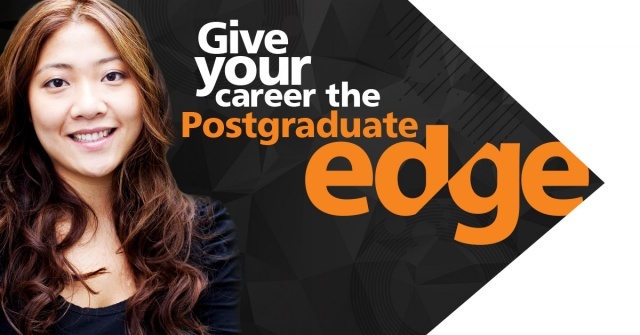 Give your CV the Postgraduate edge – whether you need a sector-specific professional qualification, or simply have a thirst for knowledge, explore our range of quality postgraduate courses. There’s a lot on offer, and new funding options which make it more affordable. For more details, click here. Also, keep an eye out on social media for tips on budgeting and looking after your finances. 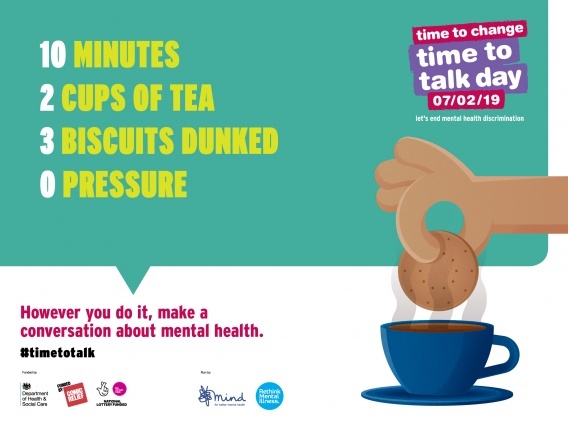 Time to Talk Day is happening on 7 February, and the theme this year is bringing together the right ingredients to start a conversation about mental health. Join the Sabbs for their Time to Talk drop-in between 11am-1pm in The Lounge for some tea & biscuits and a chat! Student Volunteer Drop-In: 11 Feb, 1-4pm, at the CORE in AH. Volunteer Champion Induction: 12 Feb, 3-4pm, AH1.21. Register your interest by clicking here and searching for ‘Volunteer Champion’. Community Impact Forum: a networking event which brings together charitable, community and voluntary organisations in the local area with staff and students at CCCU. 14 Feb, 10am-12pm, The Garden Room in The Priory. For more information and to book, click here. And keep an eye on social media for case studies, quotes and opportunities to volunteer! 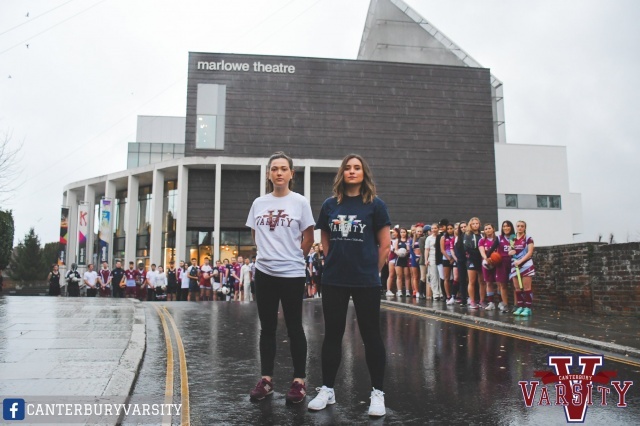 It’s that time of the year again, where Canterbury Christ Church University and the University of Kent go head to head in the biggest sporting event in the University calendar! Check out what events are happening by clicking here and make sure you save the dates to support your peers, take in the atmosphere and watch a showcase of the best of university sport within the community! Good luck Team Christ Church! Come and visit the Augustine House Library between 10am-4pm on Valentine’s Day for your opportunity to write a Love or Let down letter to the Library. And as a thank you, everyone who takes part will be put into a draw for a chance to win a box of chocolates. 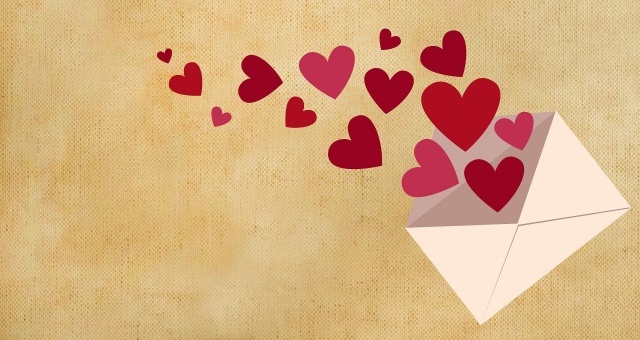 If you can’t get to the Library on Valentine’s Day, don’t worry, as they’ll have themed feedback boards available for your comments across the week beginning the 11th February. One World Week is back this month! Happening on 18-22 Feb- it’s a week-long celebration of culture, talent and diversity at CCCU. From hearing poetry from across the world to an Open Mic Night, or the International Food & Culture Fayre to film screenings- there’s something for everyone! For more information, including the full programme of events, click here. 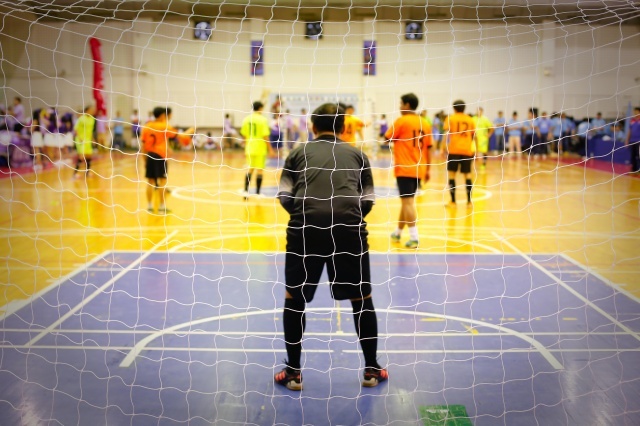 Do you dream of lifting the cup at Wembley Stadium or are you simply looking for a new hobby? Get involved with the FA People’s Cup, the most inclusive five-a-side competition in the country. As a Christ Church University student, you can register a squad to complete in the competition and be in with a chance of winning a trophy! To find out more, click here. #FeedItBack- let us know your views on IT! Do you need time to talk about something that is affecting your general wellbeing? 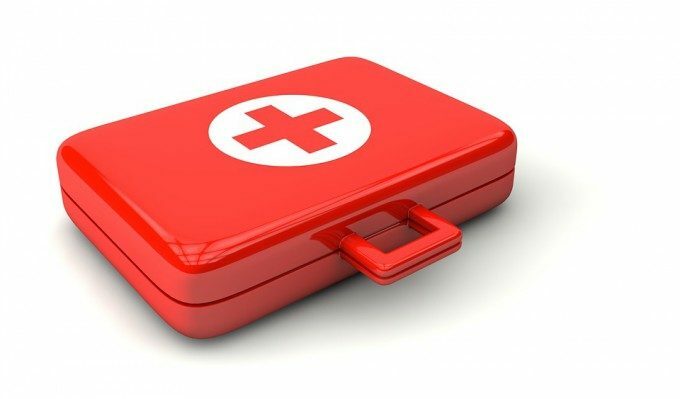 Do you need some support in managing your life and studies? The Mental Wellbeing team have introduced a Drop-In Plus service that runs every Wednesday on North Holmes Road. For more information, click here. Feeling anxious, stressed or depressed? Medway Talking Therapies which starts on 28 February could help. We are offering a six week mental health and wellbeing course at the Universities of Medway Campus based around Guided Self Help. For more information, please click here. There’s still time to register for Summer Internships- a chance for you to gain experience and skills, increase your knowledge of an industry or sector and earn money! The final pre-application workshop is being held on Friday 1 February in in AH 2.23 (14.00 – 15.30). For more information, click here, and if you have any questions you can get in touch with Caroline (caroline.demetriou@canterbury.ac.uk) or Charlotte (charlotte.revell@canterbury.ac.uk). Another way to gain skills and increase your knowledge of an industry is through work experience. 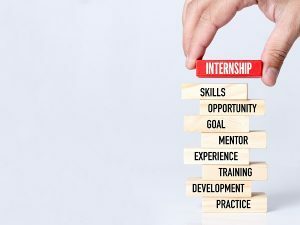 If you are you looking for work experience, but finding it financially difficult to take up the opportunity you really want – you may be eligible to benefit from two bursaries: the Travel Bursary and the Career Start Bursary. For more information and how to apply, click here. Finally, volunteering is another great way to increase your skills base- while also giving back to the community! As well as saving the date for Student Volunteering Week, you can attend the FareShare experience day happening on Tuesday 19th February, 9-3 at their warehouse in Ashford. Limited places available- so email volunteer@canterbury.ac.uk to find out more and book your place. And make sure you check out what opportunities are currently available by heading over to ccsu.co.uk/volunteering. Here are some of the events happening through Arts & Culture this month… For the full listing, click here. Drums, Drums, Drums: Our Commerical Music students do what they do best: gig! And the focus of the evening will be drummers. 05 Feb, 8-10pm, St Georges Centre. For more information, click here. Last chance to see the Emily Peasgood Exhibition on Living Sound at Sidney Cooper Gallery! Closing on 23 Feb. And the next Art Club is happening on 7 Feb, 4-6pm in the Sidney Cooper Gallery. For more information and booking, click here. Come and listen to CONTACT: the University’s hottest new ensemble fusing sound and vision technology. Happening on 25 Feb, 1:10-2pm in St Gregory’s Centre for Music. Click here for details & booking. The new Arts Building, the Daphne Oram Building, will open with an exhibition called Digital Dynamics. Running until March 1st, see work by staff and students looking at the ways in which the digital world shapes our lives. Digital Dynamics includes work by Vanessa Barrett, Callum Beasley, Bradley Bolabo, Nigel Breadman, Liam Green, Max Lamdin, Alan Meades, Kate McLean, Carolyn Oulton, Patrick Thwaites, James Tucker, Sam Vale, Georgia Watson and Penny Watts. It was curated by Liam Green, Katie McGown and Sam Vale. For all other events happening at CCCU this month, make sure you keep checking on our Student Events Calendar and our social media channels (@cccustudents).